Lena Dunham is not the voice of my generation. 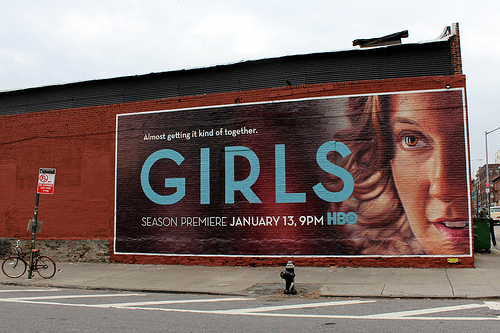 Girls is not all-encompassing. Don’t get me wrong, I adore the show and I’ll watch anything Dunham does in the future. But that doesn’t mean it is an infallible guide to being or understanding a 20-something woman. Here’s what it does get right. Each episode, especially in the second season, offers a brilliant moment of clarity where the characters realize they are lost. Whether they have the job or not, the boyfriend or not, they have yet to figure out who they are and what they want. I know this isn’t exclusive to 20-somethings. Anyone can experience that feeling of drifting at any age, at any point in history. But as a 20-something I can tell you there’s an immense pressure to do something and be someone, but this expectation that we’re too young to really know. It’s a confusing dichotomy, and lately I find myself caught up in it. I’m the type of person who’s always got a plan. I’ve got a backup plan. A backup to the backup plan. The neurosis comes from a combination of fierce ambition and the (mostly) unspoken indoctrination I experienced in high school telling us we had to get our lives together early or perish. Without a doubt, especially as a women, I’ve experienced pressure from all directions. I would be lying if I said it didn’t affect me. But then I watch these young women on television. Even if they don’t represent me, I relate. The characters think they’ve got it all figured out (Hannah had the internship and her dream, Marnie’s job at the art gallery), only to have their expectations crushed and having to orient themselves in this new world. How long is Hannah going to be a barista? Did the JazzHate article really do that much for her? Does she actually want to write an ebook? What about Marnie? If she can’t get a job in an art gallery, what will she do? What kind of person does she want to be? Seeing them struggle is beginning to make me question myself. What am I doing? Do I actually have it all figured out? If not, what comes next? I moved in with my partner when I was just barely 18. I’ve grown into adulthood with someone, which isn’t as common anymore now that people don’t have to get married young for security or because of social expectations. Marriage hasn’t compromised my identity as a strong, independent woman. But when he goes out of town for a few days and I can’t cook a thing without burning it. I don’t know how to fix whatever it is that is going wrong with my computer. I experience a terrible loneliness, I feel lost. We’ve always been attached at the hip. And then there’s my degree. When I was 17 I thought I would move to Montreal and become a dancer. Instead I’m in Calgary doing an English degree. Honours actually, because I want to become a professor. I love education, so why not, right? Again without this sense of direction I am adrift. What if I’m not as sure as I think I am? Am I leaning on my partner too much? Am I hindering my own learning? Do I want to become a professor for the right reasons? Or is it just the most easily discernible (although incredibly challenging) career path? Who am I, if not this person doing these things? Lately I’ve found myself challenging and critiquing my previous ideas of what it mean to be a spouse, a student, and the type of person I want to be. I’ll give you this, Dunham. You’ve got me often wondering if I am not so different from these intriguing and difficult girls you’ve created after all. Girls has shown me that I can unsure and still be safe, that I’m not the only one. Getting to this point, questioning my motives and desires, has been great personal growth. Once I got over being horrified by the possibility of not knowing, it’s kind of been a relief. I’m on my way to accepting that I can’t plan it all out. That omnipresent pressure hasn’t gone anywhere. CBC has called us 20-somethings Generation Jobless. Jezebel frequently publishes articles on the gaps between genders, in employment and wage. That’s not something easily forgotten. The difference is that Girls has helped to create a dialogue which has allowed me to be more comfortable with the unknown. This show has truly been revolutionary in a few ways. Most commonly pointed out is Len Dunham’s body politics, but most important to me is the way Girls is making girls examine themselves. It’s one of the most talked about series because it is making people talk about their own lives. That’s progress. Athena G. Csuti is a young writer and feminist from Edmonton, AB. She is currently studying English Honours with Creative Writing and History at the University of Calgary. When she’s not writing poetry or essays, she’s curled up with her partner and her cats watching a horror film. Follow her for weird anecdotes and debates @AthenaGenevieve.